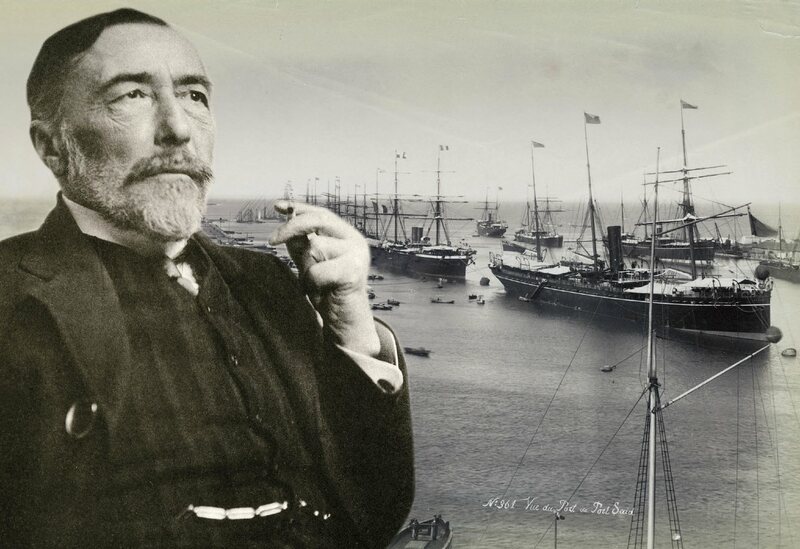 Jasanoff is writing a book, tentatively titled “The Worlds of Joseph Conrad,” that focuses on four of his novels: Lord Jim, Heart of Darkness, Nostromo, and The Secret Agent. The backdrop to Lord Jim (1900) is the era’s international and intercultural maritime life. Heart of Darkness (1899) probes the fallout of colonial empires, and adumbrates their demise. Nostromo (1904) explores political instability, dictatorship, and revolutionaries in Latin America, with a treasure in precious metal at the center of the story. The Secret Agent (1907) delves into anarchism, agents provocateurs, and a terrorist bombing—purportedly a symbolic attack on science—at the Royal Observatory, Greenwich. Unsurprisingly, ships, rivers, and oceans figure importantly in most of these books. But unlike the vessels of Herman Melville, Conrad’s ships include steam-powered ones. He writes, Jasanoff says, about the “industrialization of the sea.” Steamships shrugged off the vagaries of wind and water far better than sailboats. They also enabled cheaper, larger-scale intercontinental migrations, like those of so many Europeans to the United States: Lord Jim opens with a shipload of Muslim pilgrims making the hajj from southeast Asia to Mecca. New technologies of transportation and communication, like the telegraph, were transforming international demographics and patterns of commerce: improvements in refrigeration enabled Europeans to eat meat from Australia and New Zealand, for example. All these changes affected Conrad’s fiction. Nostromo’s title character is an Italian expatriate in Latin America; a local silver miner of English descent also figures in the plot. Conrad eventually captained a cargo ship in the Indian Ocean, and had to make telling decisions like how much wheat from Australia or sugar from Mauritius to load onboard. Jasanoff makes imaginative use of atypical sources in her research. For example, Edge of Empire: Conquest and Collecting in the East, 1750-1850 (2005), her award-winning first book, illuminated the British empire by examining individual collectors of art objects and material culture in colonial settings. Liberty’s Exiles: American Loyalists in the Revolutionary World (2011) painted the diaspora and fate of thousands of Tories after their side lost the Revolutionary War; it won the National Book Critics Circle Award for nonfiction. Literary studies, such as the well-established school of New Historicism, often seek to locate literature in historical contexts. Yet the converse doesn’t, so far, apply. “Historians remain pretty wary about the use of literature,” Jasanoff explains. “Those working on earlier eras, where there’s less available, often engage more with literary materials. For the modern period, where we have such a plethora of written materials and other documents to draw on, we tend not to make literature the centerpiece.” Jasanoff, who concentrated in history and literature at Harvard, graduating in 1996, may be perfectly positioned to rectify that imbalance—with help from Joseph Conrad.